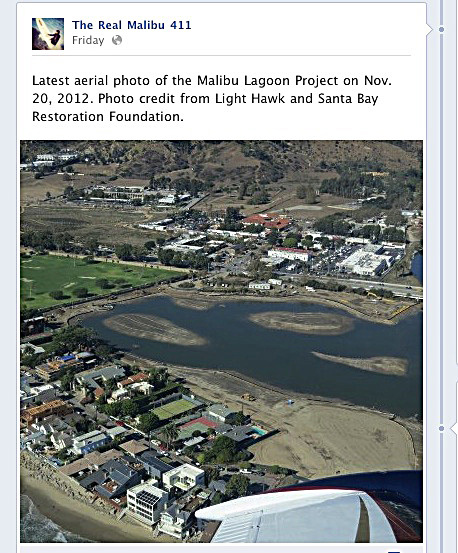 This page is primarily devoted to scenery at the lagoon, focusing on the 2012 Malibu Lagoon reconfiguration project and highlighting the process of change. SMBAS supports the project, but rather than using this page to proselytize, it is intended to be a record of what goes on. We’ll also present summaries of our monthly bird censuses and other interesting tidbits and links. We start off by putting all the photos into a slideshow. We’re keeping the show at under 150 slides, eliminating old & repetitive slides as new ones are added. Construction fences are down, pathways are open, plants are growing. The official ribbon-cutting opening ceremony was on Friday, May 3: read about it here. Slides are in reverse date order. Hover cursor over slideshow for Left Arrow, Right Arrow, Pause and Go. 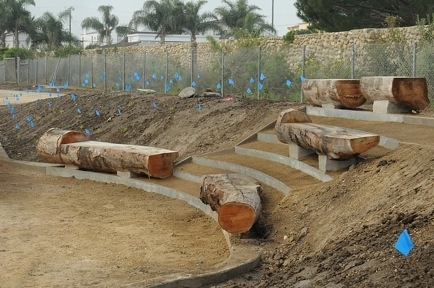 EcoMalibu website has a video page of over 20 films pertaining to the lagoon and the reconfiguration project. They are all different; you may find the underwater films listed below especially interesting. 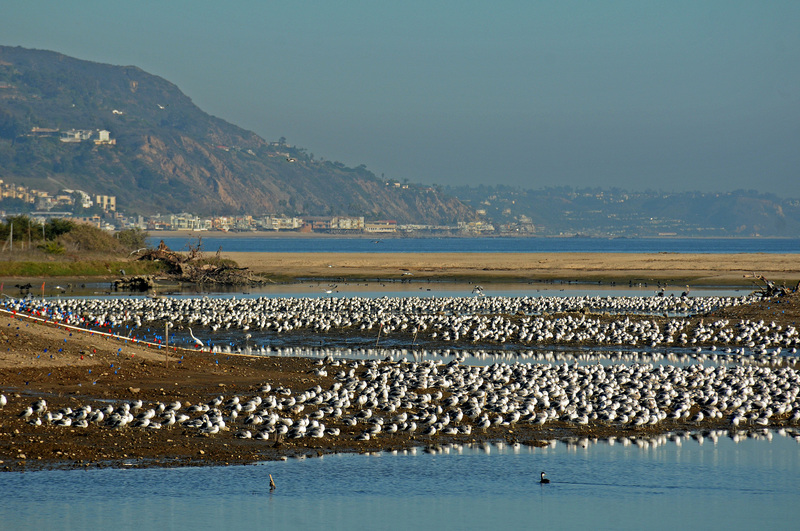 The large flock of gulls which appeared on the islands and mud flats of the breached lagoon was widely reported within the Los Angeles birding community. We rarely took photos of crud in the channel water. Who wants to look at crud? But we saw it all the time, especially in the south channel where it really piled up due to lack of water circulation. On Coastal Cleanup Day, 3rd Saturday of Sept., you could spend a whole morning trying to gather up the thousands of pieces of plastic, cigarette butts and other crud that collected at the west end of the south channel. This 5/19/12 Matt Horns photo was taken at the salinity gauge pole mid-way down the south channel, when Jane and I took a ‘water oxygen’ tour with him. A dead Brown Pelican is underwater out towards the gauge but you can’t see it in the photo due to murky water and surface reflections. Anyone need Flip-flops? I’ll send your message on to Suzanne Goode at State Parks. However, I wouldn’t hold my breath waiting for the bridge to happen. The presence of the previous, rather narrow, 3 bridges severely restricted the circulation of the channels, one of the main problems which they’re trying to eliminate. Whatever bridge they might build would have to be 3-4 times as long as were any of those bridges, as the narrowest gap will be about 120-150 feet. This would not be inexpensive and was not budgeted for, so additional funding would have to be found. It took over 5 years to find the funding for the current reconfiguration. An elevated boardwalk, such as you find in the relatively calm waters of inland marshlands, would (IMHO) be the most likely & suitable design. However, Malibu Creek has extremely high and forceful winter storm flows, bringing trees, rocks, sand, gravel and a heckova lot of water down through the lagoon. 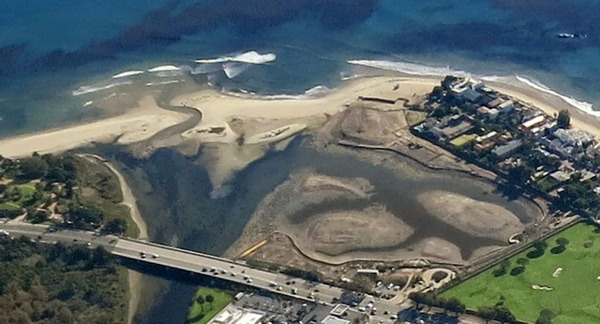 I’d fear for the stability and permanence of any bridge close to the lagoon edge, where the bridge would likely be located (see the “boot” portion in the aerial view drawing on our Project Page). The 1982-83 reconfiguration included a nice post, cement & cable fence along the NW lagoon edge, which was completely washed out, along with at least 10 feet (depth from lagoon edge) of embankment, in the first big El Nino storms that came along. Excellent. We all appreciate your wisdom and knowledge. Thank you Chuck. Excellent job. Looking at the survey data, it seems that while species diversity is fairly constant over the five-year time range, population numbers have significantly declined. It would be good to look at a longer time period if the data are available. I will resume my field trips in July during work days. We will observe restoration activities and I will explain what they are doing and why. I disagree about population numbers. 2007 was a high year; since then it’s been down, up, down, up and down. 6 years is all I can fit into the width permitted by this blog program. I took another look at the table and figured out that a 10-year comparison would fit after all.